On Saturday 3rd November around 100 local residents and campaigners took part in a protest wildlife walk against the proposed £100m World Logistics Hub at Manchester Airport. The protesters braved the cold to take a route around the 90 acre former greenbelt site, which is threatened by the plans to build 43 cargo sheds and almost 1,500 car parking spaces. Local residents, wildlife enthusiasts and environmental campaigners spoke at various points along the walk, sharing their experiences of fighting Manchester Airport expansion and highlighting the numerous ways that the plans would affect local people and the environment. The Wildlife Walk came the week after the Wythenshawe Area Committee ‘recommended for approval’ the World Logistics Hub plans, on the 25th October. The application will now be sent to the Planning and Highways Committee at Manchester City Council for a final decision on 22nd November 2012. Campaigners argue that job creation figures proposed by the airport are inflated. On Saturday 3rd November around 100 local residents and campaigners took part in a protest walk against the proposed World Logistics Hub at Manchester Airport. 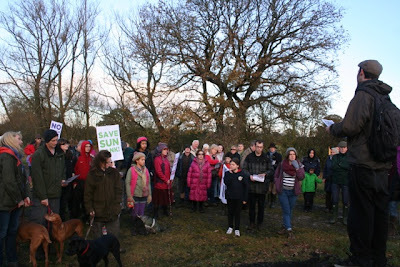 The protesters braved the cold to take a route around the 90 acre former greenbelt site, which is threatened by the plans to build 43 cargo sheds and almost 1,500 car parking spaces. Local residents, wildlife enthusiasts and environmental campaigners spoke at various points along the walk, sharing their experiences of fighting Manchester Airport expansion and highlighting the numerous ways that the plans would affect local people and the environment. The Wildlife Walk came the week after the Wythenshawe Area Committee‘recommended for approval’ the World Logistics Hub plans, on the 25th October. The application will now be sent to the Planning and Highways Committee at Manchester City Council for a final decision on 22nd November 2012. A number of attendees at the Wildlife Walk, keen for their concerns to be brought to this Committee, pledged to attend this November meeting at Manchester Town Hall. Several Councillors of the Wythenshawe Area Committee backed the Logistics Hub plans based on the Airport’s promises of local job opportunities. However campaigners argue that job creation figures proposed by the Airport are inflated. The Wildlife Walk was also an opportunity for wildlife experts to explain that Airport’s promises of preserving wildlife are also unrealistic, and that creating a ‘mitigation zone’ is no substitution for leaving habitats untouched. Along the route, campaigners encountered the threatened habitats of numerous plant and animal species. Several mature oak trees line Sunbank Lane, providing nesting opportunities for rare birds, and potential roosting spots for endangered bat species. The site is also home to 12 ponds occupied by Great Crested Newts, an endangered species found only in the North West of England. Walkers were also able to spot signs of protected animals for example badger snuffle holes and mole hills in the green space around Sunbank. Manchester Mule coverage here.Manchester Evening News coverage here. Residents living near the proposed site of a £100m logistics hub at Manchester Airport are planning a protest against the plans. Hundreds of people are expected to gather near the proposed site on Saturday and take part in a protest with a difference – a wildlife walk. The campaigners are furious at plans to build a ‘world-class’ cargo centre, which will form part of the £650m Airport City project and is expected to create more than 1,800 jobs. They are objecting to it because they claim it could ruin their neighbourhood and destroy the surrounding countryside. Now, they are planning to descend on the area for a family-friendly walk around the woodlands and fields earmarked for development. They claim that the project could threaten animal and plant species, as well as increasing traffic congestion and carbon emissions. Airport bosses say the centre will house cargo space for freight companies, offering businesses unrivalled access to air and motorway links. An outline planning application has already been submitted and it is thought that construction could begin before the end of the year. Audrey O’Donovan, local resident and chair of Ringway Parish Council, said “The World Logistics Hub, should it get final approval, would result in serious loss of amenity and environmental damage for local people. The walkers will set off on their route – which will cover land in Altrincham and Hale – at 2pm and want as many people as possible to support them. The cargo centre has been recommended for approval by councillors from the Wythenshawe Area Committee, subject to conditions, including access to footpaths and minimising noise levels. The final decision is expected to be taken by Manchester council’s planning and highways committee next month. Airport bosses say they hope it will create more than 1,800 permanent jobs over the next 10 to 15 years, in addition to construction posts. It will form the southern part of the Airport City’s Enterprise Zone, which was unveiled by the government last March. An airport spokesman said: “World Logistics Hub will help existing airport businesses to expand as well as attract new businesses to the north west region. This will generate much-needed economic growth and many jobs. Posted: Sunday, November 4th, 2012. Filed in News about Airports, Publicity & Politics, Recent News.